Have you ever traveled to a new and faraway place, and, upon arriving, had a gentle feeling of "I'm home" ...an overwhelming sense of recognition and remembrance? For me, that place is Bali. I started my love affair with Bali long before we met in person, and each time I return, she rises to meet me with a soft welcoming spirit I feel in no other place. My time in Bali is filled with magic moments, every step of the way. Each time, I find myself awed by her people: their open hearted way of living, their reverence for spirit and nature, and their overwhelming sense of belonging to something grander than their everyday world. 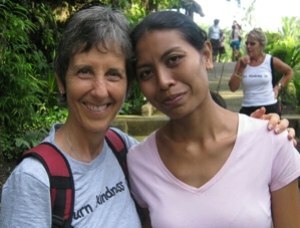 I've made some amazing friends through the years, two of whom are doing incredible work for the children of Bali. My More than a NUT MILK BAG project began with a simple idea to create work opportunities for local women while generating much needed funding for some worthy causes. Each year I visit, I go to see the seamstress who makes my wonderful bags. She puts so much love into each one, I can feel it when I unpack them back home. I'm so happy to be able to bring this little piece of Bali to my friends back in the US. So when you consider buying my More than a NUT MILK BAGs, please remember that this little exercise of the Fair Trade principle helps support the seamstress and also helps two charities which are near and dear to me. Bumi Sehat Birthing Center (bumisehatbali.org) is a a world-renowned mother and child welfare project founded by Ibu Robin Lim. (Ibu is an honorary title that means "Mother.") Bumi Sehat is a non-profit, village-based organization of dedicated families, midwives, doctors, nurses, teachers and volunteers from Indonesia and around the world. While I was there last year, four babies had been born in the previous 24 hours and Robin was present at each birth. 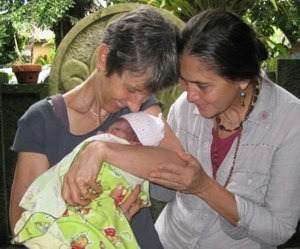 To say that Robin is a godsend to the women of Bali is an understatement. Caring for the women and the future of this country, she makes a difference every day of her life. 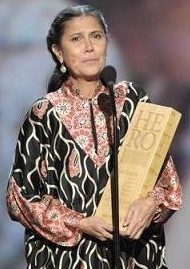 Never say that one person can't make a difference: Ibu Robin does, and we are proud to help her. Girls just want to have fun ! 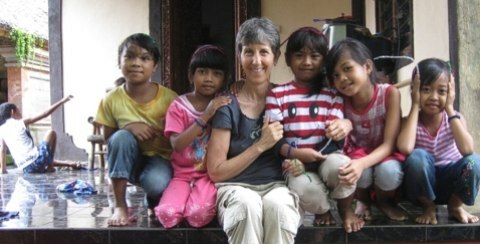 Brenda and the little ones at Widya Guna. Yayasan Widya Guna Orphanage is near Ubud, Bali. When I first visited the Yayasan, I immediately fell in love with Ketut, his wife Nyoman, and the many children they care for. These two amazing people have dedicated their lives to providing the basic necessities for the children who find their way to the orphanage. Being parentless in a developing country is hard enough; imagine being parentless and handicapped! (You can't.) Yayasan Widya Guna Orphanage is one of the only resources for handicapped children on the island. These challenged kids would have no other opportunity to live a normal life were they not a part of the safety net provided here. Each day all the children enjoy meals, education, computer time, art class, cultural education with dance for the girls and gamelan lessons for the boys. The children are incredibly happy and on their way to becoming amazing adults. A special note: I just had to share the picture of the children of Widya Guna celebrating. I'm behind the red pom pom, next to Putu � my email pal. Even if you can't see me, it doesn't matter, they were so excited and this picture just shows it all. Both of these charities are independently funded by donations from around the world. I am committed to being a part of their ever-growing family of supporters. Remember, a portion of every purchase of a More than a NUT MILK BAG goes to these very worthy charities. We guarantee your purchase will benefit the children. I look forward to my annual visits, when I deliver much needed supplies and the cash donation from sales of the More than a NUT MILK BAG.